Eagerly awaiting our kids, at Seattle-Tacoma International Airport. After a record-breaking Northwest heat wave, it seemed as though the sky gave a sigh of relief on August 5th, bringing forth clouds, sprinkles of rain, and the perfect cool breeze for moving heavy suitcases into new cabins. The American campers were warmly welcomed to the Treacy Levine Center with Chef Russell’s delicious fajitas and enchiladas as they eagerly waited for their Israeli and Palestinian peace pals to arrive. The community felt incomplete without them. The American campers’ inquiries increased as time passed. They asked, “Has their plane landed yet?”, “Where are they now?”, and “How long until they get here?” Finally the bus full of new friends pulled up. 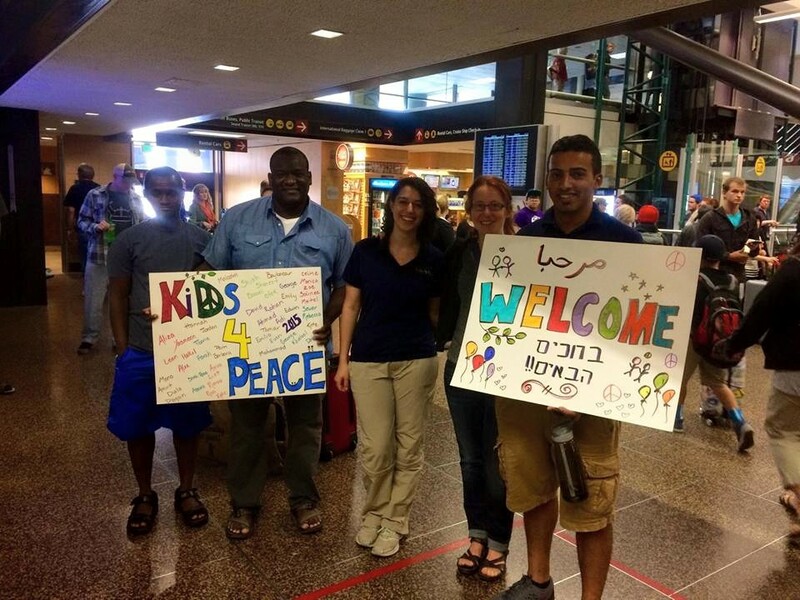 Greeted with signs and cheering, the campers and staff from Jerusalem exited the bus and joined our Kids4Peace Seattle family. Though they were undoubtedly excited to be at camp, it was obvious that they had been awake for a very long time. Travelling across ten time zones is quite a feat! Through the rest of the night’s activities, the campers did their best to keep their heavy eyelids from closing. It was surely a whirlwind for all of them. The group’s energy waned as the staff led introduction activities and icebreaker games. By dinnertime, it was clear that the kids were ready for bed. Only one session separated them from a long night’s rest: Closing Dialogue. Here at Kids4Peace, we end every day by bringing all the campers together for a short debrief. This conversation is led by our dialogue leader, Pam, who believes the most important part of dialogue is that everyone feels included, heard, and understood. For the first night, we closed our day with a discussion about thankfulness. One by one, the campers went around the circle saying one thing that they were thankful for. Some were very simple things like food, good weather, and sleep. Others were thankful for family, new friends, and the sponsors that helped make camp possible for them. It was a beautiful way to start off our time here. Thankfulness is a universal concept. It is an idea embraced by Christians, Muslims, Jews, and Druze alike. Though there are many things that differ between us, we all feel the need to show appreciation for the things we are blessed with in life. In every circumstance, we are all called to shift our attention away from distress and toward God, the source of our blessings. Despite the unfamiliar people and place, despite the severe lack of sleep after a very busy day, and despite the initial cultural differences, all of our campers were united by a shared gratitude for the opportunity to be together. The staff team here at camp is thankful to have the opportunity to be with these incredible campers. Though we have known each other for only a few hours, we have already begun to see glimpses of peace. And this is only the beginning! As our community grows closer together, we will surely continue to be led by the spirit of thankfulness—for this place, for this organization, and most of all, for each other.